Don't miss the splendid "slide show" of Costa Manos's American Color at Magnum in motion. Leave your sound on (but, for those at work, it does have sound). And when you're done, click on the "Leica M8" link. Highly enjoyable, highly recommended—come back to this later if you don't have time now. There is also a book . Featured Comment by Adam McAnaney: Thanks for pointing this out. I was particularly struck by this statement in the audio commentary, "It is harder to make a warm, human, compassionate picture in color than it is in black and white." I haven't read anything on color theory, so I hope you will forgive me if I'm saying the obvious, but this is something I have struggled with, in slightly different form, for a while. I still shoot film, generally color slide film and B&W print film. Without the easy ability to manipulate color, I have noticed exactly what Mr. Manos stated, that it somehow seems “easier” to make appealing black and white pictures. At first I just thought it was because I was stuck in the cliché that “art” pictures are in black and white and that therefore my brain was somehow subliminally telling me that those pictures must be better, because they look more like ART. Then I noticed that I found a lot of color pictures appealing where the photographers had somehow “manipulated” the colors digitally, either by increasing saturation (admittedly not too many of those), decreasing saturation or somehow just making the colors different, provided it was done tastefully. Mr. Manos pointed out the difficulty with photography in his commentary: anyone can pick up a camera and become a photographer, so it is hard to tell a good picture, with thought and intent behind it, from a casual, lucky shot. I think that pictures that have color that is not true-to-life (or don’t have any color at all) help to signal to us that whoever took the picture was trying to say something. This helps us look beyond the subject, or rather it helps us to put the subject and content of the picture in context. This problem seems particularly acute when looking at pictures I take of my everyday surroundings. Color slides of my neighborhood look too much like what I expect them to look like, so that I can’t get past the fact that it’s a picture of my street or my neighbor or that tree I pass on the way to work. Even if I had some sort of artistic intent when I took the picture, it just "looks" like a snapshot to me. The slide looks like a reasonable representation of whatever the subject of the picture is, so I only "see" the subject. If I take the same picture in black and white, I find that I focus on contrast, tonality, composition, all the things I was thinking of (or hoping for) when I took the picture. Does this mean that you can’t have an excellent picture with true-to-life colors? No, of course not. Does this mean that casual snapshots can’t be excellent pictures? No. Is intent necessary for art? I’m not heading down that road, at least not now. Still, I will point out that Mr. Manos’ use of large blocks of strong, saturated colors, while possibly true-to-life, also help to communicate to the viewer that these are intentional, artistic pictures. And excellent ones at that. Excellent use of high saturated colors. Thanks for posting this link. I've always loved Costa's work. For those interested in studying with him, he teaches at the Maine Workshops every year. It'll take a few seconds for the page to load. Under photographers, click on Harry Gruyaert. Click on Portfolio and you'll be able to see his "Rivages" series. They're beautiful grainy seascape/horizon photos. I also like still another Magnum color photographer better than Manos: Alex Webb. The comment by Adam McAnaney was extremely insightful. I feel the same way about color versus BW. May be we all do in some way. I always thought of a possible interpretation of this biased point of view that might be the same as Adam's on a slightly different approach. May be it's about the amount of information. The color images have a lot more information. That information easily detracts from the more subtle concept we get from the BW version, if it's not very specifically related to it. BW accentuates size, shape, tone, makes them the rulers of the image, while color could be seen as a second conceptual info layer that, if not "overlapping" precisely in our subjective mind with the BW image, throws it "out of focus". I think BW is a few steps closer to abstraction than color photography, a kind of conceptual synthesis, and using fewer stronger colors would work in the same way too, pointing the way to look (reinforcing the presence of an author's intention too). May be one could use a minimalistic approach on photography, not using color unless and until we find a real need for it, in the way some people start sketching with black pencils long before jumping into oil. But things have gone too far for that now, I guess. "everything is too obvious, often to the point of triteness"
I thought that was the point. It's the choice of colours what makes me (I'm not American) "acknowledge" the images as genuinely American. In that sense, I think that "American color" is a very smart title. Of course, it's a cliche to associate saturated, rather than subtle, to the concept of "American color", but I understand that Manos is using that cliche to add "truth" to his photographs. 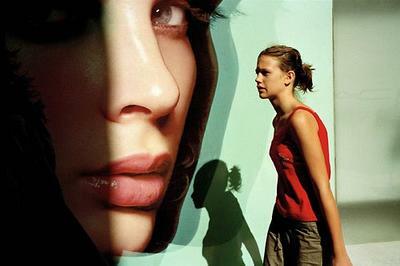 As for Harry Gruyaert's work, it's just a different thing (also great). The pursuit of Surreal-ity, the use of vivid color and the agressive use of the slightly disorienting visual effect of the wide angle lens are all artistically well-grounded techniques in the hands of a skilled photographer. Manos is certainly that. I am just not certain if he is a "sensitive" one. The use of vivid color and WA lens create a very in-your-face photograph - his intent, no doubt - but for me, when I view the photographs a kind of visual fatigue sets in (kind of like listening to loud music on a crappy stereo), and eventually, I just want it to to end. It starts to "hurt". And, IMO, his statement that "It is harder to make a warm, human, compassionate picture in color than it is in black and white." just doesn't hold water in light of, say, Joel Sternfeld's Passing Strangers. A few photographs can be found here. Sternfeld's large format/color neg/"normal-ish" lens portraits are "warm, human, compassionate", yet they seem to strike a more thoughtfully ambiguous "uncomfortable" attitude that doesn't depend on the obvious techinques employed by Manos. Me, I'll take thoughtful over obvious any day of the week. Wow, these photos are great. But the comment about color is classic of the b&w shooter who believes if he uses color, the photo must be ABOUT color. The subject is simply the color's bearer. It's nonsense.